For much of the eastern United States, spring arrived in February while winter finally came knocking in March. If you’re confused about which season it is, not to worry — winter is now over. Spring officially began Monday morning with the arrival of the vernal equinox at 6:29 a.m. Eastern. While warm spring days will be tough to come by in the short term, the equinox is a reminder that the sounds of chirping birds and humming lawn mowers aren’t too far off. What’s the significance of the equinox — and why are day and night not quite equal? Check out these five questions (and answers) to learn more. 1. What happens on the March equinox? Like the September equinox, Monday’s equinox is one of two days of the year when the sun can be seen directly overhead along Earth’s equator. Since the Earth is tilted on its axis of rotation by 23.5 degrees, the Northern and Southern hemispheres receive different amounts of amounts of sunlight throughout the year. 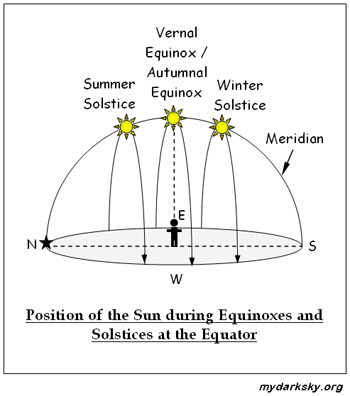 On the equinox, however, the orbital plane of the equator becomes geometrically aligned with the center of the sun so that neither hemisphere tilts away from or toward the sun. As a result, each hemisphere receives roughly equal amounts of daylight and darkness. 2. Why are there more than 12 hours of daylight on the equinox? The unequal day and night are due to atmospheric refraction and the way we define sunrise and sunset. Atmospheric refraction is an optical phenomenon that bends the sun’s light as it passes through Earth’s atmosphere. This causes the sun to appear slightly higher in the sky than it is in reality. The other reason is how we define sunrise and sunset. The sun appears as a disk, not a single point. Sunrise is defined as the moment the sun’s upper edge appears on the horizon, while sunset doesn’t occur until the sun’s upper edge disappears from the horizon. Together, these factors add about 10 minutes of daylight to the equinox, depending on one’s distance from the equator. 3. Where does the sun rise and set on the equinox? The March equinox is one of only two days each year when all points on Earth — apart from the polar regions — see the sun rise due east and set due west along the horizon. Until the summer solstice in June, the sun will continue to rise and set farther to the north. Careful sun observers might notice, though, that the sun appears to rise due east and set due west a day or two before the equinox. Once again, atmospheric refraction comes into play. Since sunlight gets refracted as it passes through Earth’s atmosphere, the rising and setting sun will appear slightly north of due east and west, respectively, on the equinox itself. 4. How quickly are we gaining daylight? The table above shows many cities gain about an hour and half of daylight during the month of March alone. The rate of daylight change depends on your latitude, or distance from the equator. In Miami — located just north of the tropics — daylight increases by only 91 seconds per day at its peak. At the opposite extreme lies Fairbanks, Alaska, where — just 200 miles south of the Arctic Circle — residents see the sun up for nearly 7 minutes longer each day around the equinox. 5. It’s spring — why is it still so cold? After the cold days of winter, we tend to expect spring weather to be warm and sunny. While the increasing daylight and higher sun angle eventually usher in warmer weather, spring tends to be a fickle season and is slow to start in many places. In most of the Lower 48, spring as a whole is actually a few degrees colder than fall, despite the days being much longer. Here in the District, meteorological spring averages 3 to 4 degrees colder than fall. If you like warm weather, time is on your side, though. Spring can be slow to arrive, but with the sun up for more than 12 hours now, tulips, bees (and allergies!) will be here soon enough.